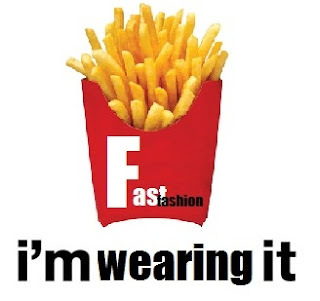 McFashion as I like to call it cause it reminds me of the well known fast food chain, originally called “Fast fashion” is the term used to describe products of cheap quality and price concerning both male and female apparel. As a fashionista I am you already think you know my point of view on McFashion, but I bet you have guessed wrong. I ain't a millionaire nor someone that affords to buy a lot of brand apparel. Actually I cannot afford most of them. Though that doesn't mean I spent my money on cheap fashion to just do it. Searching a bit with a little bit of luck I discovered my dream brand named Conquistador. I am not writing to advertise anyone I just wanna let people know that there are true original and mind blowing brands out there in really economic prices, so this fake excuse about not affording to buy clothing isn't so true especially when it is being claimed by people that spend a 200 bucks on Bershka's “fashionable” clothes. Now the why I am a bit in favor of these chains is that you can get the basic stuff in extremely low prices. A white shirt doesn't have to cost a million dollars so buying one from Zara sounds okay. A pair of conventional jeans could work just fine from Zara too along with a scarf or a belt. But that's all there is. The whys I am against are numerous and I'll start by the basic one that people seem to ignore. Underaged people from all around the world with Chinese being first followed by Africans work in extremely dangerous conditions in order to feed and avoid starving to death. These people are treated like animals and their lives mean nothing to their employers in comparison to the profit they make out of your ignorance. They create luxurious stores and promote a very professional company profile while in fact they are based on the disgrace of people like us. They hate fashion for the same reason you love it. Because it is cheap. If it wasn't they would work for something more grossing and the salaries would be higher. I will try to post a link later on with a documentary based on the exact theme I analyzed above hoping that you will have seconds thoughts next time you walk these McDoors. Now the practical part. I challenge you to think how much money do you spend on clothing each year. It is estimated that people spend a 100 bucks per season on clothing (average) which means 200 bucks per year. What you buy gets you exited for a short amount of time and next year the trends that these brands know exactly how to promote change dramatically from 30s to 80s for example and suddenly you hate your clothes more than I hate Nickie Minaj!!! In 20 years you spend over 2.000 euros on clothing to end up having nothing but pieces of cheap fabric full of holes and stretches. And when you reach 35 you suddenly have nothing to wear and have to spend a lot of money to build your closet with the very basics that you then find out you are missing. So McFashion is money consuming and promotes low prices to quality. What's next is something that deeply hurts me, annoys me and infuriates me. We are talking about the most idea stealing companies ever existed. They violently copy high fashion designers' designs and sell them in humiliating prices that lack quality and the Idea behind the cloth. I truly believe that ideas are worth a billion dollars and stealing them is awful to the bone, I hate it and shout about it. Why wear a fake Louboutin pair of heels? If fashion is important to you, you know that this ain't right. And if it is not then why wear Louboutin? It doesn't make sense. Last but not least, the originality part. It is funny indeed that I used the term originality to describe something so destructive for the term Original itself but I have to mention the following funny memory of mine. I went out with my besties at a Mall that a lot of people hung out to and while walking around and watching the window displays of stores as those aforementioned I saw a tragical purple jacket with the brand name on it like it was Mugler or something. Twenty minutes later I counted about 5 to 10 males wearing the exact same jacket I saw before on that tragical window display. That happens all the time with most of the garments they sell on these stores. A lot of people looking alike in awful clothes. Harmful to the common eye and to aesthetic in general. Becoming a humanoid sheep is sad even as a thought. If what I am writing is insulting you in any way then I succeed. I wanted to further along a message of awareness to those who consider people of the fashion industry obsessed with things that ain't important like clothing. Fashion is about aesthetic, the issue of them all. Wearing Chanel doesn't make you cool because of the double C C but because of the philosophy of the very cloth, the fabric and quality the history behind a legendary couture house. Search the web for brands that sell clothing from a 100 bucks to 200 bucks. Buy one piece per year and when you can afford it buy a second one. Visit a McFashion store and buy the basics like the little black dress for women and a white shirt for men. You will feel much better and do something for some crucial problems to be solved.